As part of a book order last year, I picked up a copy of Bamboo Rediscovered by Victor Cusack. This wonderful book draws on decades of experience to show that bamboo doesn’t have to be an invasive monster, and that bamboo poles are tremendously useful, in the garden and elsewhere. So when it came to protecting our apple harvest against fruit flies and other pests, I turned to bamboo. I sourced a bunch of 3m long poles from All Stakes Supply, who had them delivered to me in just a few days. I also created box frames around my key apple trees, covered by insect netting. The result is rather impressive looking, I think. Protecting my apples trees against fruit fly, using a bamboo structure and insect netting. Full disclosure: my knot skills are still pretty patchy, so some of the frames held up, and others slowly slipped apart. Practice makes perfect! I now have a good collection of robust bamboo poles, which should last many years, and be useful for a dozen different projects. This entry was posted in Growing our own food, Making our own and tagged apples, bamboo, tomatoes. Our summer harvest, converted into jars of pickles and chutneys. It’s been a hot summer in Sydney, with some much-needed rain after an extended dry period. So as usual, the summer glut of produce overwhelmed our immediate needs. This entry was posted in Cooking, Growing our own food and tagged chutney, cucumbers, pickles, preserves, preserving, summer, tomatoes. Warrigal greens, native to Australia and New Zealand, grows vigorously in Sydney. While in theory it’s an annual, it self-seeds so vigorously that once you have one plant, you have a steady supply forever. On more than one occasion it’s kept us going when we haven’t had any other greens growing, such as spinach or kale. It can be used just like spinach, with the proviso that warrigal greens must be cooked for at least 3mins (it’s high in oxalic acid — which is toxic — and the cooking breaks that down to make it safe). Start by adding some olive oil to a saucepan over a medium heat. Cut the fresh tomatoes roughly into pieces and add to the saucepan. Cook until the tomatoes break down into a rough sauce, helping the process by squashing the tomatoes with a potato masher or heavy spoon. This will take 10-15 mins depending on the varieties of tomatoes used. Cut the garlic into thin slices and add to the pan along with the basil leaves. Add the strained sauce back into the pan, and cook for 20-25mins to reduce to a thicker consistency (it will still be quite thin, but that’s OK). Meanwhile, set the the oven to its highest setting, and place a pizza tray in to pre-heat. Bring a large pan of water to the boil, and add the warrigal greens. Cook for 3 minutes, and then pour out into a strainer. Wash with cold water, and then squeeze the moisture out. Thinly slice half a red onion. Cover the pizza base with the fresh tomato sauce, and some of the cheese. Scatter generously with the warrigal greens, and top with the sliced onion. Add a little flaked salt, and then cover with the remaining cheese. Put into the oven, and cook until golden brown. It’s a super-simple recipe, and the warrigal greens are just like spinach but with a rounder flavour. If you have picky eaters, don’t tell them it isn’t spinach, and they’ll never know! This entry was posted in Cooking, Growing our own food and tagged cooking, pizza, summer, tomatoes, warrigal greens. With the hot weather in Sydney, we’re well and truly back into summer tomato season. We’ve got a wide variety of tomatoes growing, large, small, red and yellow. These are just a few, picked early to ripen in our kitchen away from the pests. 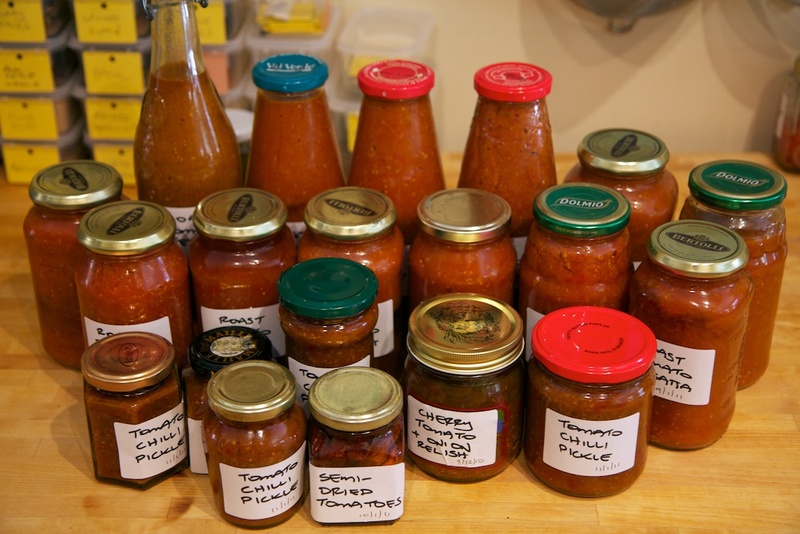 Most meals now include some tomato, and we’ve started bottling and pickling like mad. This entry was posted in Growing our own food and tagged summer, tomatoes. This hasn’t been a great summer season for the garden. The lack of sun and constant rain has meant that many seeds haven’t germinated properly, plants have grown up stunted, and yields are way down on last year. Still, you can’t go past these two beauties! I can see why they’re they’re the “Mortgage Lifter” variety, each one big enough to feed a small family. Even in coldest summer in 11 years (or 40, depending on who you listen to), we’ve still got more tomatoes than we can eat. So the canning equipment has come out, for a dozen jars of various chutneys, relishes, etc. Definitely better than nothing! The warm, wet weather has meant a glut of tomatoes this summer. We’ve also had few fruit fly (although an invasion of moths and caterpillars). The result has been dozens of kilos of tomatoes, far more than we can eat. This was, however, the plan. With the bounty of tomatoes, I filled many jars. The photo above is what’s left, after giving quite a lot of it away. Not bad out of 7 square metres of space (plus the jungle at the back). This entry was posted in Growing our own food and tagged pasatta, pickles, relish, summer, tomatoes. 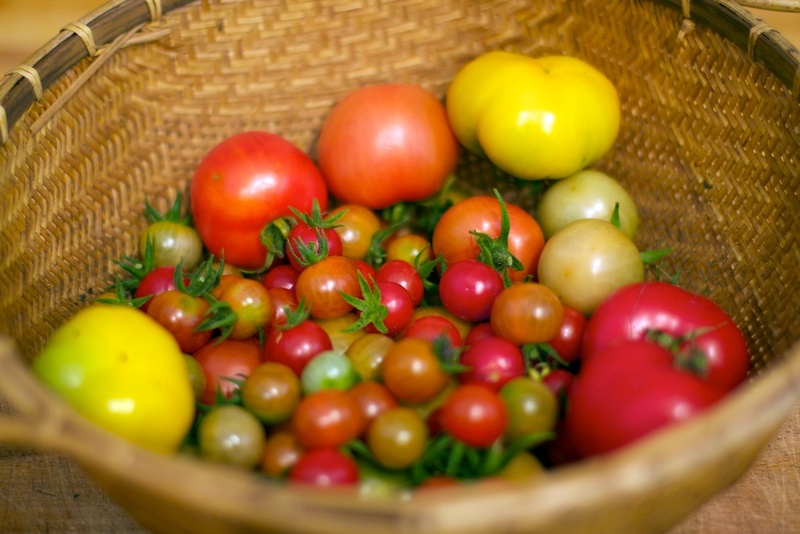 This entry was posted in Growing our own food and tagged heirloom, preserving, summer, tomatoes.